More than 8.2 million households were without power in 17 states as far west as Michigan. Nearly 2 million of those were in New York, where large swaths of lower Manhattan lost electricity and entire streets ended up underwater — as did seven subway tunnels between Manhattan and Brooklyn at one point, the Metropolitan Transportation Authority said. The New York Stock Exchange was closed for a second day from weather, the first time that has happened since a blizzard in 1888. The shutdown of mass transit crippled a city where more than 8.3 million bus, subway and local rail trips are taken each day, and 800,000 vehicles cross bridges run by the transit agency. “Everybody knew it was coming. Unfortunately, it was everything they said it was,” said Sal Novello, a construction executive who rode out the storm with his wife, Lori, in the Long Island town of Lindenhurst, and ended up with 7 feet of water in the basement. The scope of the storm’s damage wasn’t known yet. Though early predictions of river flooding in Sandy’s inland path were petering out, colder temperatures made snow the main product of Sandy’s slow march from the sea. Parts of the West Virginia mountains were blanketed with 2 feet of snow by Tuesday afternoon, and drifts 4 feet deep were reported at Great Smoky Mountains National Park on the Tennessee-North Carolina border. As organized civilization came roaring back Tuesday in the form of emergency response, recharged cellphones and the reassurance of daylight, harrowing stories and pastiches emerged from Maryland north to Rhode Island in the hours after Sandy’s howling winds and tidal surges shoved water over seaside barriers, into low-lying streets and up from coastal storm drains. 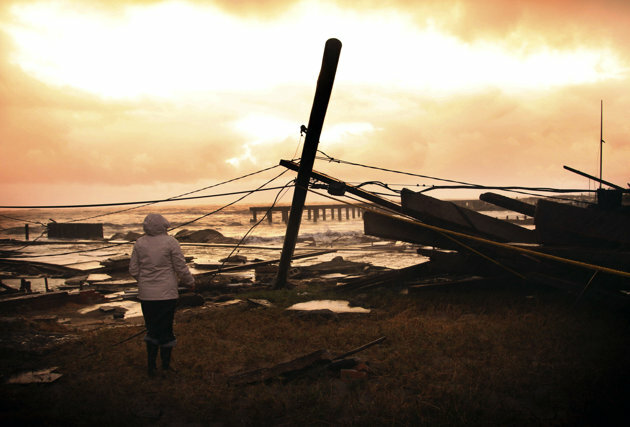 Images from around the storm-affected areas depicted scenes reminiscent of big-budget disaster movies. In Atlantic City, N.J., a gaping hole remained where once a stretch of boardwalk sat by the sea. In Queens, N.Y., rubble from a fire that destroyed as many as 100 houses in an evacuated beachfront neighborhood jutted into the air at ugly angles against a gray sky. In heavily flooded Hoboken, N.J., across the Hudson River from Manhattan, dozens of yellow cabs sat parked in rows, submerged in murky water to their windshields. At the ground zero construction site in lower Manhattan, seawater rushed into a gaping hole under harsh floodlights. One of the most dramatic tales came from lower Manhattan, where a failed backup generator forced New York University’s Langone Medical Center to relocate more than 200 patients, including 20 babies from neonatal intensive care. Dozens of ambulances lined up in the rainy night and the tiny patients were gingerly moved out, some attached to battery-powered respirators as gusts of wind blew their blankets. In a measure of its massive size, waves on southern Lake Michigan rose to a record-tying 20.3 feet. High winds spinning off Sandy’s edges clobbered the Cleveland area early Tuesday, uprooting trees, closing schools and flooding major roads along Lake Erie. “This is the biggest challenge we’ve ever had,” said George R. Gilmore, chairman of the Ocean County Board of Elections. By Tuesday afternoon, there were still only hints of the economic impact of the storm. Forecasting firm IHS Global Insight predicted the storm will end up causing about $20 billion in damages and $10 billion to $30 billion in lost business. Another firm, AIR Worldwide, estimated losses up to $15 billion — big numbers probably offset by reconstruction and repairs that will contribute to longer-term growth. 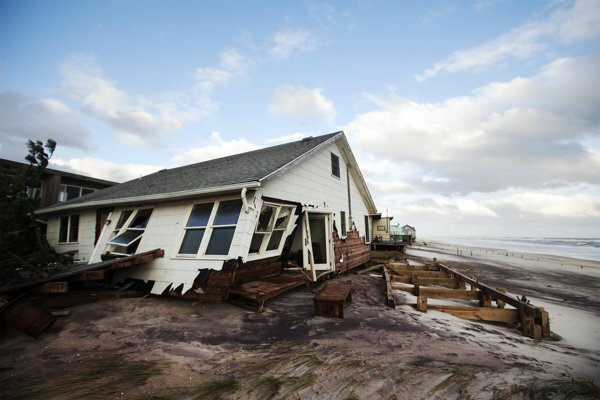 “The biggest problem is not the first few days but the coming months,” said Alan Rubin, an expert in nature disaster recovery. Airports were shut across the East Coast and far beyond as tens of thousands of travelers found they couldn’t get where they were going. John F. Kennedy International Airport in New York and Newark International Airport in New Jersey will reopen at 7 a.m. Wednesday with limited service, but LaGuardia Airport will stay closed, officials said. It became, pretty much everyone agreed Tuesday, the weather event of a lifetime — and one shared vigorously on social media by people in Sandy’s path who took eye-popping photographs as the storm blew through, then shared them with the world by the blue light of their smartphones. By Tuesday evening, the remnants of Sandy were about 50 miles northeast of Pittsburgh, pushing westward with winds of 45 mph. It was expected to turn toward New York State and Canada during the night. Although weakening as it goes, the storm will continue to bring heavy rain and flooding, said Daniel Brown of the National Hurricane Center in Miami. This entry was posted in Current Afairs, Uncategorized and tagged america without power, aviation, climate, damage by sandy, damages caused by sandy, destructions of sandy, electricity, mass transit systems, nature, sandy leaves unthinkable damage, sandy storm, science, transportation.